On August 24, in the days of celebrating the millennial anniversary of the unification of the Mordovian people and the peoples of the Russian state, Saransk, the capital city of Mordovia republic, visited the President of Russia Vladimir Putin. 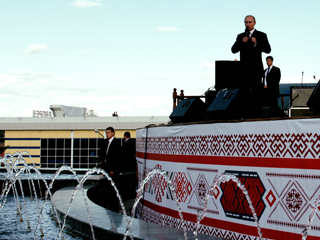 Speaking from the rostrum, established on the territory of the fountain complex "Forever with Russia", the President congratulated the tens of thousands citizens and the guests of the jubilee celebration who crowded every places around. "Here a lot of guests from different corners of our huge country, and at once it is visible, that we are all very different," said the President, "but only when we are together, we are Russia!" 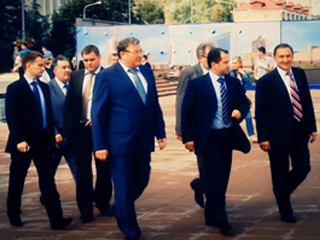 On August 24 the construction site of the new record fountain "The Star of Mordovia" was visited by distinguished guests: the Primate of the Russian Orthodox Church, Patriarch Kirill, the Governor of the Samara region Nikolay Merkushkin, for many years the head of Mordovia, the current head of the Republic of Mordovia, Vladimir Volkov, the Chairman of the Government of the Republic of Mordovia Vladimir Sushkov, and other officials. The guests got acquainted with the course of construction and starting-up and adjustment works, having given a high assessment of the object, which is being prepared for commissioning. 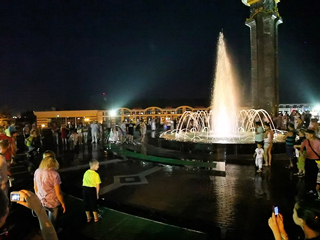 On August 7 in the framework of preparation for celebrating the millennial anniversary of the unification of the Mordovian people and the peoples of the Russian state took place the solemn start of fountain complex "Forever with Russia". In the solemn ceremony of the opening of the complex took part the Head of Mordovia, Vladimir Volkov, Chairman of the state Assembly of Mordovia Vladimir Chibirkin, the Chairman of the Government of the Republic of Mordovia Vladimir Sushkov, mayor of Saransk Piotr Тultaev. 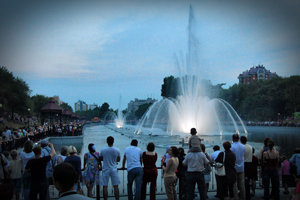 The start up of the first amusement musical Tornado fountain took place in Moscow. 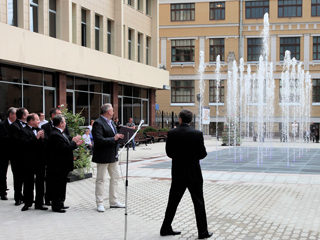 Our new fountain is situated in the middle of the square in front of Plekhanov Russian University of Economics. Specialists of Borond Group of Companies have made installation and fully complete commissioning of the fountain in a short time. June, 29 2012 was the day of solemn ceremony, which showed a fountain possibilities with the first water jets. At the end of may Khabarovsk celebrates the Day of the city. To this day the grandious fountain at the Lower pond appeared in all its glory. 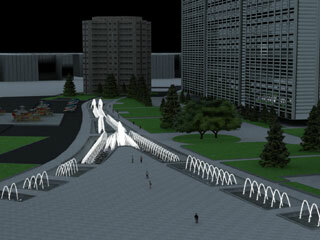 The fact, that the huge dynamic and lighting capabilities of the fountain, pledged at the design stage, when the first time start was partly implemented. The reason for that became extremely short terms of construction. This spring, the servicemen of the Borond group of companies unblock a hidden until the reserves, and in Day of a city residents of Khabarovsk and guests of the regional center saw the water extravaganza so as it was conceived. Borond group of companies starts a new construction season. Borond group of companies starts a new construction season. 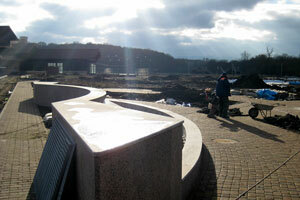 After a short winter break resumed work on the musical fountain "The Star of Mordovia". This grandious fountain built in honor of the significant event in the life of the Mordovian Republic - 1000-anniversary of the unification of Russia and Mordovia. The audience will see a lot of surprises. Incredible height, robotic jets' dance, amazing lighting effects, and many other miracles will be a worthy decoration of the festive opening day. 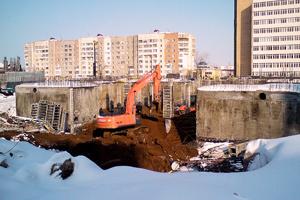 The construction of dynamic fountain complex for a JSC "Gazprom" business center in Krasnodar is nearing the end. Five cups of the complex will soon began to play a with the streams of water, symbolizing the various aspects of gas production. In Moscow, on the JSC Gazprom's "OilGasCity" location, the construction of a record-length amusement fountain complex "Gamma" has begun. The complex is really impressive with its length of 242 meters. The opening of this record amusement fountaun complex is scheduled for 2012. 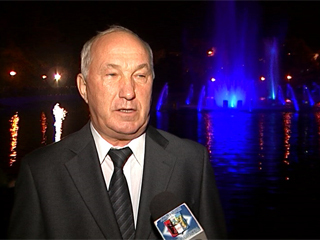 The Mayor of Khabarovsk Alexander Sokolov told about the new amusement fountain "Ussuriyskiy" and about cooperation with the Borond Group of Companies . "...The beauty that the Borond Group of Companies has created, will please tens of thousands of Khabarovsk citizens and guests of the city of Khabarovsk for a long time. And I am very glad, that the group has fulfilled the task in a short time, ensuring good quality and long reliability of project. Probably, it is the most important thing that we need. This fountain turned out great and beautiful, and we can see that today nobody has invited for the opening, but the people came themselves with great pleasure to spend time here. They came, guests came, many of them came here with the children. This is new landmark of the city. I believe that Nizhny pond with this wonderful fountain, one of the largest in Russia, will become the visiting card of the city of Khabarovsk. From all my heart I want to thank the Borond Group of Companies for the high quality object." 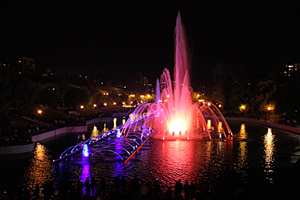 On October, 4th was the opening of the "Ussuriyskiy" amusement fountain in the Lower pond at Dynamo park in Khabarovsk. This fountain is a record by its characteristics (height jets up to 35 meters, total length is 220 meters). For the first time it equipped with a robotic jets of the new generation. On the day of the opening dozens of thousands of citizens filled the embankments of the pond, alleys of the park and crowded all around. They were joined the participants of the 5th Far eastern International Economic Forum. The symbolic launch button pushed the governor of Khabarovsk Krai Vyacheslav Shport. Swept up bright jets of water, play the solemn music, the evening sky lit with fireworks. Like spellbound people has watched the water extravaganza.